Jamie Owens hopes to open “It’s All Fun and Games” later this year. CULLMAN – The Cullman City Planning Commission on Monday evening agreed to forward a request from local businessman Shane Quick to the city council with a favorable recommendation. Quick submitted a request for the City to abandon property adjacent to the Ponder Building at Clark Street Northeast and First Avenue Northeast. The site in question is a concrete slab which is currently used as the outdoor patio for Rumors Deli. The City’s abandonment of the property would open it up for sale to Quick, who owns the Ponder Building. Quick told the Tribune that the addition of that narrow strip will allow the construction of an elevator that will give the public access to the upper floors of the Ponder Building. With commissioners noting previous instances in which the City has sold such parcels, a motion to forward the request to the city council with a favorable recommendation was approved. 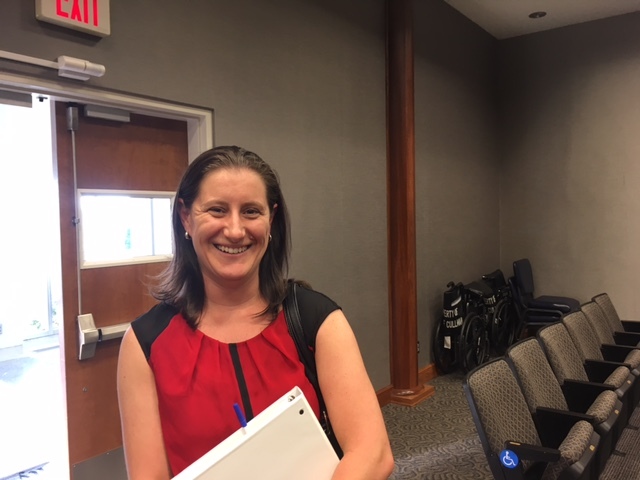 Another big part of the meeting was a conditional use request from Jamie Owens for construction of an indoor playground at Fourth Street Southwest and Logan Street Southwest. Owens explained the concept of the indoor playground, comparing it to an enlarged version of the play area at the Cullman Chick-fil-A, and described a facility with separate play areas for toddlers and older children, a sensory area for special needs children and a vending/snack area. Her request was approved. A request from Tanina Baker for a short form subdivision that would move a property line between two adjoining parcels she owns at the intersection of 14th Street Northeast and Fourth Avenue Northeast, giving her a larger parcel to live on, but maintaining the required lot size and frontage for the other. The request was approved. A request from Dr. Ronald Carter to subdivide a lot at Convent Road Northeast and Longbrook Drive Northeast. Since the subdivision would create lots that do not meet the City’s lot size requirements, the request was denied. The commission told Carter that he could appeal to the zoning board of adjustments, but that the request would create a City ordinance violation. A request from Rodney Kinney to rezone a lot at 1006 Second Ave. NE from manufacturing to business. The site houses a convenience store, and the current zoning appears to be an oversight. As all surrounding lots in the area are zoned for business, a motion to forward the request to the city council with a favorable recommendation was approved. A request from Judy Speegle Shannon and Bob Shannon to rezone a lot they own at Third Street Southwest and Denson Avenue Southwest from central business district to residential, so they could build a house on the currently vacant property. As all surrounding properties, including houses, are zoned CBD; and a change on that one lot would constitute impermissible “spot zoning,” a motion was passed to forward the request to the city council with an unfavorable recommendation. A request to approve a change in site plans for the new Milo’s Hamburgers on Patriot Way Southwest. The change would only affect the construction plans for routing of stormwater drainage. With a favorable recommendation from City inspectors, the request was approved. A proposed site plan from Civil Engineer Phillip Piercy of Littlejohn Engineering Associates for a dialysis clinic on Broadway Drive Southwest came under intense scrutiny, as commissioners pointed out errors in the text, missing engineers’ stamps and other problems. Piercy was present, and personally addressed numerous questions, also noting that he had submitted a revised plan to City inspectors. The inspectors expressed satisfaction with the revision, except for minor issues. The revised plan was approved, pending minor corrections. The Cullman City Planning Commission meets at 5:30 p.m. the first Monday of each month in the auditorium at Cullman City Hall. The public is invited to attend.